Deconstructing the Myth of "The First Thanksgiving"
Abenaki basketmaker and educator, Judy Dow, will discuss the many myths surrounding the celebration of the “First Thanksgiving: how they may have come about, what purpose they serve and why, year after year, they are perpetuated in classrooms across the country. What is so seductive about this particular story and what is its impact on Native people? Judy is a member of the board of Oyate, a non-profit organization working to see that the lives and stories of Native people are portrayed honestly. She reviews literature by and about Native people and will talk about books we are all familiar with as well as make recommendations for excellent, more culturally appropriate books and other resources. Judy is a positive and dynamic speaker with a great comittment to educating parents, teachers, librarians and children about celebrating cultural diversity with respect for everyone. You can read Judy Dow's paper on this topic at at http://www.oyate.org/resources/longthanks.html. Bristol…The One-World Library Project will host a free program, Deconstructing the Myths of “The First Thanksgiving” presented by local educator Judy Dow at the Lawrence Memorial Library in Bristol on Thursday, November 13, at 6:30 p.m. Judy is an Abenaki basketmaker and educator who teaches at the grade school and college level and serves on the board of Oyate, the American Indian Scouting Association and Gedakina. 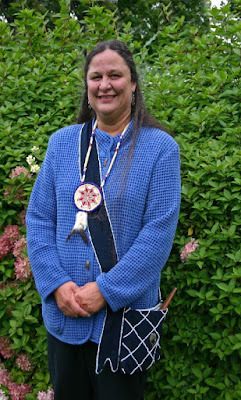 She is the 2004 recipient of the Governor’s Award for Outstanding Vermont Educator and serves as a commissioner on the Vermont Commission on Native American Affairs. Judy lives with her family in Essex Junction. Judy Dow works on the board of Oyate, a non-profit organization working to see that the lives and stories of Native people are portrayed honestly. Their work includes: critical evaluation of books and curricula with Indian themes, conducting “Teaching Respect for Native People” workshops, and distribution of books and materials with an emphasis on writing and illustration by Native people. With Beverly Slapin, Judy researched and co-authored a paper on the many myths surrounding the celebration of the first Thanksgiving; how they may have come about, what purpose they serve and why they are perpetuated year after year in classrooms across the country. She will discuss books we are all familiar with and the inaccurate way they portray this historic American event as well as recommend more culturally accurate books and other resources. Judy’s informative talk will be of particular interest to teachers working with children on American history and Native American stories and culture. It will also be helpful to parents or anyone looking for new ways to give thanks for a bountiful harvest in a multi-cultural manner – celebrating old traditions in a way that is respectful to all.